Bungie Studios community manager, Brian Jarrard told IndustryGamers that the studio "definitely has plans in the works" for future games but that they "are not looking at one particular piece of technology right now." Bungie are worshiped on the 360. They might upset their fan base. If they make a PS3 game thats anything less than exceptional they will be ridiculed by PS3 owners as a one trick pony. But you don't get anywhere without taking a few risks. So I say bring on a Bungie PS3 game. I highly doubt that'll happen any time sooner. Always a possibiility but none that I see happening in a year or two. Maybe towards the end of the PS3 lifecycle or when Sony launches PS4 but right now, I just don't see that happening. I am not sure what games they have made so far but I have never heard anything else coming from Bungie except HALO. Even if they do announce a new IP and goes multiplatform, I don't think I'll get too excited because IMO HALO is extremely overrated. I like Bungie, and would love to see a game by them on my ps3. I know maybe... it seemed.... that they may have milked their engine and stuff, but that still doesn't let my hope down that they can do something worth my money on the ps3. Take it or not, halo, was and still is a great multiplayer game. If they are going to develop something on the PS3 I just hope it's not a FPS. The 360 is done. This is the equilvilant of losing Santa Monica Studios, Naughty Dog, and Polyphny Digital to multiplatform. It's 360's basically only first party developer other than Rare. Bungie multi platform dev? I like the idea, maybe that way people will stop stereotyping them for the sake of this stupid console war and actually accept that they are one of of the devs of the last 15 years. If they don't get their head out there as* and make a few games, when finally release a game on the Ps3 it will look like a ps1 game compared to the SOny exclusives releasing at the time. How about a remake of Marathon, multiplat? Eh? eh? Why would they be ridiculed as a "one trick pony"? The marathon series was EPIC, and story-wise blows Halo out of the water. They Myth series were awesome RTS games in their time, Oni was alright, slated to be much more then cut back before release, but was still decent for a fighting game. Then there are all the other old school classics (vikings anyone :) Bungie has a more successful history than a lot of developers. Halo is in actuality a spin-off of the marathon series (you can find marathon logos throughout halo games, and find some intertwined lore if you're looking. I'd actually like to see bungie bring something back from the Myth universe, though i'm not sure if they sold off that IP. With M$ owning the rights to halo, i am curious how they would handle it if Bungie were to ever make "marathon" games. Are you people really this closed minded? Do you really think the average 360 gives a f*** if Halo or some other Bungie game ends up on the PS3 or even Wii? I only own a PS3, but IF someone like NaughtyDog were to make a game for PS3 and 360 I would still buy it (assuming it was a good game of course). As long as it does not wipe my hardrive, I would be more then happy with a new Myth game. But Marathon is my first pick. i loooved that game. The HD version on the Xbox was great also. Both companies have a strong following on their respected consoles and yet the rumors of them doing something for their competition will always be arouns until one of them actually does. I am betting both will likely release games on the DS before they cross platforms. You figure both are considered "independent" yet their respected console MFG's have first dibs on anything for a home console but not a handheld. it takes a real tech head and mad skills to use the full power of the ps3, is bungie up for the challenge? i say bring it, ps3 has so many bada** games right now, 1more wouldnt hurt. But its bad thing for Bungie to make PS3 games because it would upset their 360 fanbase? I love Bungie for their work on Halo on the XboX and the 360, and on top of "the option" comment, them not working on Halo hurts a little. I know I also got a PS3, but it's kinda hard to see them on the PS3. I just hope whatever they do next, if it's multiplatform, is really great and shows PS3 fans that Bungie, as developers, are up there with Insomniac, Naughty Dog, and whomever you can name when it comes to gameplay. Still, I kinda knew something like this might be said since they bought themselves out of Microsoft's first party status. I think it was because Microsoft ticked them off when they wanted to make that announcement about ODST or Reach a year or so back. You win the dumbest comment of the day. Thanks for the laugh! On topic: I'll reserve my judgement on Bungie about being "a one trick pony" of their next game when said next game is actually out. "uh ya know bungie has worked on the ps2.."
The day Microsoft allows a Halo game on Playstation 3 is the day pigs fly, but I'm sure we'll eventually see some Bungie made multiplats on PS3. hmmm now that i think about it, bugie DID just file a new game trademark not too long ago. 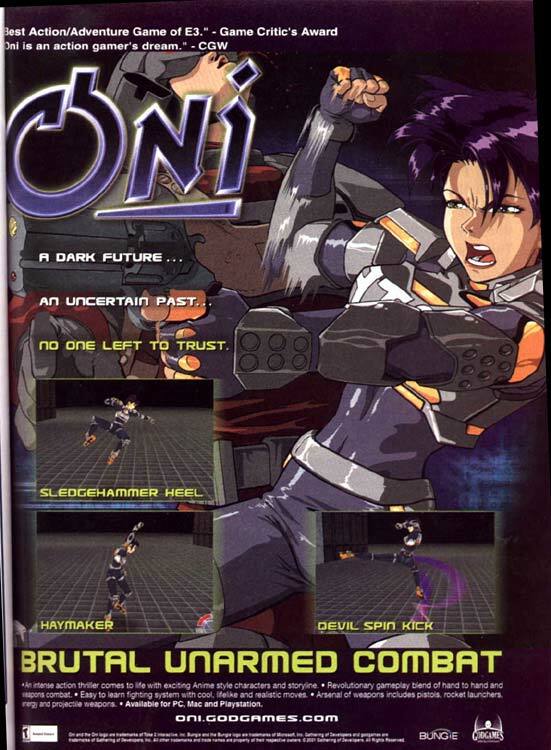 was like the first PS2 i ever played i think, no wait that was Timesplitters... Oni was my Second! They are a one trick pony as they wont make anything other than Halo games anymore as they know there games are mediocre and the Halo name is the only reason they sell. Do they even have this option? I was aware that whatever IP Bungie created, Microsoft had a say in it first, and if they didn't care about it, then Bungie could do whatever they wanted with it. That was the game that made me buy a PS2! I was adamant that I would hold out for a price cut, Oni is a PS2 launch title. Game made me run out the next day to get a PS2! Unparalleled hand to hand and future weapons, you could only carry one weapon and a pistol, but they made it amazing and limited ammo forced hand to hand combat a lot. The environments were incredible for the time. I wasn't trying to delude myself with the PS3! Ok not once did he actually say that in the article, its not quoted from the actual rep. Do you guys seriosuly think Microsoft just let Bungie go after owning them? Oh sure you bring home the bread for our console so we'll just let you guys go off and produce for a different platform. If anyone thinks this they are delusional. Punching themselves in the scrotum while chewing shards of glass is an option too, doesn't meant they're likely to do it. "are not looking at one particular piece of technology right now." Most fanboys on either side are mouth-breathing stunted scum who are more interested in what passes for loyalty in this situation, than in actually playing the games. Devs only have the appearance of "loyalty" based on what skillsets they have invested in. That's about money, not loyalty. I say, bring on a PS3 Bungie game. There is nothing wrong with that in my eyes. But that won't stop the bottom-feeders from jeering from both sides, 360 fanboys against Bungie, PS3 fans against all of Xboxdom. Rather than Bungie taking stock of their losses and contemplating remaining a MS-only dev, we should simply turn the fanboys who will make a big deal out of this into soylent green. Then, they might be of use to us. It would make sense. Being exclusive to 1 platform is cutting out a potentially huge revenue stream. I like exclusives. We all should like exclusives. The more things begin to be common to everybody, the less competition there will be, the lower the quality, the higher the price we will pay. Or more multiplats means more developers (including indie) turning a profit, there for creating more games, and more competition. You can look at it either way. The competition isnt purely MS Vs Sony, but between developers themselves. There's plenty of scope for both exclusives and multiplats. I didn't mean bring Halo to the PS3, I was talking about them developing a new IP for the PS3. I do not agree with your opinion twelve, it is an opinion, and not fact. The question here is not wether exclussives are good or bad. The question is whether bungie being a mutli plat dev is good for the industry as a whole or not, and I think it is. Sony, MS and nintendo will still be competive and will keep on marketing exclussives, even if Bungie goes the multiplatform way. And yet, Fishy, if all games became common to all consoles, there would soon be no need for different consoles. This would ultimately lead to there being one console, which would be ridiculously expensive. There would never be a need for a price drop. It's a very healthy thing for us as gamers to see Nintendo, Sony, Microsoft and whoever else at each other's throats, battling exclusives, wanting us to buy one console or another. The prices will always stay low, and the quality will always stay higher. And this is why, ultimately, even "fanboyism" is healthy for the industry, because competition and the fans driving them will always bring us the best games overall. Like I said, "There's plenty of scope for both exclusives and multiplats." Your talking as if there are suddenly going to be no exclusives what so ever, that isnt going to happen, platform holders need something to help their console stand out from another, this is done through exclusive content. Exclusives aren't going anywhere and a few more multiplats from what are historically exclusive developers isnt going to turn the industry on its head. Basic microeconomics state that in a perfect competitive market the product tends to be homogenius and the benefits to the producer tend to be 0 so its better for consumers but producers and investement tend to shift to other markets. So no competition isnt always better. I believe and hope there will always be a healthy proportion between exclusives and multi-plat games, for the reasons I've stated above. However, I'm sure you have heard David Jaffe's and others talk about how in the future, there will only be one console, and that all devs should compete in that fashion. That would be the very worst thing for us as gamers overall. That's all I'm saying. So I have to admit that I don't get too cheery when I see yet another dev going multi. Greysturm ---- Basic economics and historical evidence shows that competition is always beneficial in a "healthy" economy. It's the extremes that have to be avoided --- too much competition, which will choke an industry, and no competition at all, which leads to a MONOPOLY. And basic economics, at least in Western Culture democracy, says that a monopoly is always bad. They are only "good" in socialist and communist environments, and what has history taught us about that? yeah, what has History taught us about that? Do tell. the rest of what you explained is common knowledge to any rational person twelve, you are not teaching us anything. Its not about content or shoving enough money in a devs face they keep a title off of another system for a year, its about honestly getting the most out of one platform. Of tweaking a game engine so that it exploits and pushes a console's abilities. The 360 was designed around the idea of quick easy PC ports and development and hasn't much depth. That's its been out longer yet can't produce something similar to anything like Uncharted, that it has yet to set anything but sales benchmarks, says as much. Its also a bad thing that they've got gamers thinking about sales and saturation, instead of quality. considering the fact the ps3 is a tech beast, its no wonder bungie might actually make a game for them. You mean their Mac roots motion. Why not. One perk of being an independent studio is to do what you want, when you want. thats true...........unless you sign an exclusive 'first rights' publishing agreement with one of the console manufacturers. they can do whatever they want, as long as its on a microsoft platform. i think they will do well, why wouldn't they one of the top devs on the xbox, i think ms is mad to let them go "thank you for all you have done for xbox but .. where going to have to let you go." lol , Good luck bungie , now go make a awesome multi plat game !!! its must to be something competly diferent than Halo..you know original. Anything is possible. Actions speak louder then words so we shall see in the future. Game Boy is also an option. So are Windows 3.1 and Commodore 64. That will only happen if MS chooses it to, since part of the deal was MS gets to see their new games first before they go to anyone else. You do know Microsoft only owns the rights to Halo right? Because if they own Bungie then they wouldn't have help on Uncharted 2 (Go check out my first post). 360 users can handle losing Bungie, because what is left after that? Bungie is not a 1st Party from MS.
Not to mention MS lack of 1st Party developers compared to Nintendo and Sony. Forever and ever? For a limited time frame? For a limited number of titles? Please provide links to the contract so we all may see. PS3 is becoming the viable option, it's out selling Crapbox on a weekly basis worldwide. Devs are seeing this shift and are switching. Makes loads of sense. If bungie wants to make games on PS3 they had better bring something better than Halo...Honestly if that is all they can do they can stay with the xbox, and people that praise sub-par crap. I say Bungie stays on the 360. Sony needs some competition, and if Microsoft loses the only reason to consider buying the failbox there would be no competition left. For whatever reason, this uninspired SD mess of a game sells in bunches no matter how bad it is. This sort of behaviour wouldn't work on a Sony console, since Bungie would have competition from other games that is non-existent on the 360. Bungie's inept games would sell very poorly on the PS3 where quality matters. "SD mess of a game"
"This sort of behaviour wouldn't work on a Sony console"
"PS3 is becoming the viable option, it's out selling Crapbox on a weekly basis worldwide. Devs are seeing this shift and are switching. Makes loads of sense"
"It's just that when so many people have Xbox -- I mean over half the market or more has Xbox 360s -- why limit yourself to one platform?" - Ninja Theory Co-Founder Tameem Antoniades. I just said the truth and i get a disagree THIS IS FnCKING HILARIOUS!!! "But not the first option" says Brian Jarrard.